Paul Jones has been working at Argeneau industries for two years. Each day he looks forward to having the same break as Jean Louise, even though she doesn't even realise he is alive. Paul, a recent widower and a single dad, sometimes feels guilty about his attraction to Jean Louise but he cannot stop watching her. When his daughter ends up with terminal cancer, Paul quickly realises that the only way to save her is to turn her. He contrives a plan and goes through his options only to be pushed into kidnapping Jean Louise by a visit from the infamous Margarette who encourages him to follow his heart. Paul desperately wants to save his daughter but when he kidnaps Jean Louise he finds that he wants more than his daughter live a long happy life, he wants a life with Jean Louise as well. Unfortunately, according to immortal law, Jean Louise only has one turn. If I had to describe The Lady is a Vamp in one word, it would be predictable. This is the second time Sands has used kidnapping as a vehicle to have her lovers in proximity with each other. From the moment Paul kidnapped Jean Louise, there is never any doubt that he will be her lifemate and that they will stroll into HEA together, horny but with smiles. I kept thinking, haven't I read this before? The moment Jean Louise realises that Paul is her lifemate, she stops trying to escape and actually helps him to evade hunters. Jean Louise's only issue she is only able to turn one mortal and Paul wants her to save his dying daughter Livvy. Jean Louise realises that in his desperation, Paul would do anything to save Livvy and naturally wants him to agree to be her lifemate without the big elephant in the room causing a problem. Jean Louise is clear in her training not to get to close to mortals because they die, therefore; avoiding the temptation to turn them but finds herself doing everything she can to ease the child's pain. So, Paul and Jean Louise are supposed to be on the run from the hunters but they have time to have camp fire nights and go shopping. No wonder the hunters found them in short order. At this point, I stopped believing that Paul and Jean Louise are actually scientist and intelligent people. If Sands is going to have her characters on the run, they should act like it. Smart people don't stay in the area after they have spotted. Canada is a big country, and the two could have gone anywhere but chose to stay in Southern Ontario. Yeah for smart people. When Livvy is turned by Jean Louise after suffering a mortal wound, everyone pities Jean Louise because now she cannot turn Paul. Jean Louise and Paul have only known each other for a couple of days and have already declared true love. Jean Louise however decides that she cannot stick around and watch Paul die, as he is destined to do in 40 years because it would be to painful. I found myself laughing at this because in each book Sands would have us believe that after only a few days, readers should invest in the romance but The Lady is a Vamp proves the exact opposite. True love is faithful. We all know each day that it could be snatched from our grasp at any moment but we get on with the business of living. Paul isn't facing some terrible life ending disease or condition when Jean Louise decides to leave him, he's simply living his life. Jean Louise's decision makes her selfish and makes me absolutely doubtful that what these two people feel for each other should be labelled anything other than lust. Jean Louise is another in a long line of female love interests who doesn't think they're beautiful despite all evidence to the contrary. Jeanne Louise would never forget the description of herself that he’d written in the story of his brother Etienne and Rachel’s finding each other. A woman as beautiful in her way as Lissianna and Marguerite were, though she looked nothing like them. Her face was rounder, her lips a little thinner, her eyes more exotic and her hair was a midnight black. She’d never thought of herself as beautiful, especially compared to her aunt and cousin. When Jeanne Louise took her measure against them she always felt she was lacking. And she’d certainly never thought of herself as being anywhere near exotic. She still didn’t, but it made her think maybe she wasn’t so bad after all. Every time Jean Louise thinks of Lissianna in particular, her thoughts are all about how she isn't nearly as beautiful. Would it kill Sands to have a female protagonist who isn't worried about something regarding her body. Can we just have a body positive, intelligent love interest please? Is it really asking too much? Paul isn't any more likable than Jean-Louise. Regardless of his intentions and justifications, Paul still decided to kidnap Jean-Louise. He chained her to a bed and drugged her. These are not the actions of a good man and this is probably why Sands doesn't have Paul or Jean-Louise have a chat about what happened. Paul also is not a confidant man. When he surrounded by immortals, he quickly realises that they view him as a fragile and that he is not as strong or fast as them. He is quick to equate his relative weakness with being viewed as feminine. “True, but he’ll survive if he falls off the roof. You might not,” Julius said calmly, then patted his back. “Come, you can help me get beer and snacks." “Good. So come help me.” Julius turned and continued up the hall and Paul reluctantly followed the older immortal into the kitchen. He was still irritated that they wouldn’t let him up on the roof. He was mortal, not handicapped. So let's review, because Paul feels that his masculinity is challenged by being around people who are stronger and faster than he is, he equates that with being feminine. Yep, this must mean that he sees feminine as less than and certainly not the equal to masculinity because he is disturbed to be thought of as feminine. When Paul thankfully gets called on it by Julian, Paul stops attacking the feminine and then this able bodied man invokes disability. At best, it makes him a whiner at worst a sexist and I am leaning hard on sexism, as he repeatedly compares himself to a woman each and every time he starts to feel his relative lack of physical strength. Paul just doesn't want to get treated like "a girl". I'll admit that I was drawn in by the sick Livvy. A child that young shouldn't feel the pain that she does. Unfortunately, I was far more invested in what would happy with Livvy than I was about what would happen to Paul and Jean-Louise. Neither Paul or Jean-Louise are particularly likable and their story came a little close to Greg and Lissianna to make me feel like I was reading a new romance. In the last few books, the few things that I have liked about this series have seemed to disappear completely. 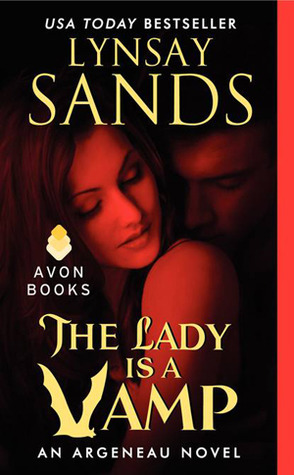 There's absolutely none of the trademark Sands humor in The Lady is a Vamp either. This is simply a nothing, forgettable story with boring characters and an extremely thin plot.